Glaciers and ice caps cover about 10% of the world’s landmass. These are concentrated in Greenland and Antarctica and contain 70% of the world’s freshwater. Unfortunately, most of these resources are located far from human habitation and are not readily accessible for human use. According to the United States Geological Survey (USGS), 96% of the world’s frozen freshwater is at the South and North Poles, with the remaining 4% spread over 550,000 km2 of glaciers and mountainous icecaps measuring about 180,000 km3 (UNEP, 1992; Untersteiner, 1975; WGMS, 1998, 2002). Groundwater is by far the most abundant and readily available source of freshwater, followed by lakes, reservoirs, rivers and wetlands. Analysis indicates that: - Groundwater represents over 90% of the world’s readily available freshwater resource (Boswinkel, 2000). About 1.5 billion people depend upon groundwater for their drinking water supply (WRI, UNEP, UNDP, World Bank, 1998). - The amount of groundwater withdrawn annually is roughly estimated at 600-700 km3, representing about 20% of global water withdrawals (WMO, 1997). 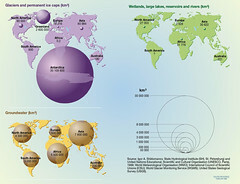 - A comprehensive picture of the quantity of groundwater withdrawn and consumed annually around the world does not exist. Most freshwater lakes are located at high altitudes, with nearly 50% of the world’s lakes located in Canada alone. Many lakes, especially those in arid regions, become salty through evaporation, which concentrates the inflowing salts. The Caspian Sea, the Dead Sea, and the Great Salt Lake are among the world’s major salt lakes. Rivers form a hydrologic mosaic, with an estimated 263 international river basins covering 45.3% (231,059,898 km2) of the earth’s land surface, excluding Antarctica (UNEP, Oregon State University et al., in preparation). 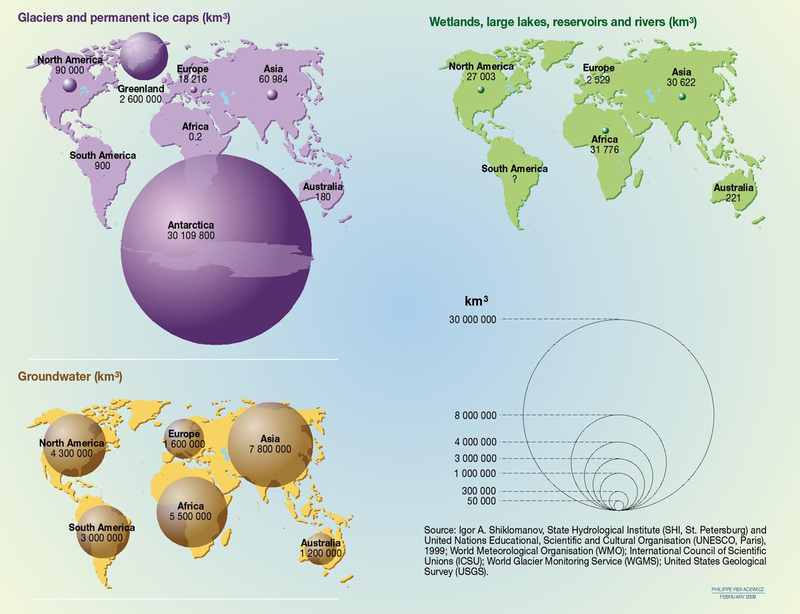 The total volume of water in the world’s rivers is estimated at 2,115 km3 (Groombridge and Jenkins, 1998). For any form of publication, please include the link to this page and give the creator credit (in this case Philippe Rekacewicz, February 2006) If the high-resolution file is not available, please contact grid@grida.no for request and permission for usage. Water - cooperation or conflict? Who will not reach the water and sanitation millennium development goal?